Nest Box With IR Camera Lets You Learn About The Birds And The Bees – Minus The Bees | OhGizmo! Now you can teach your kids about the birds and the bees – well at least the birds part – without all that awkwardness. (Human babies hatch from eggs right?) 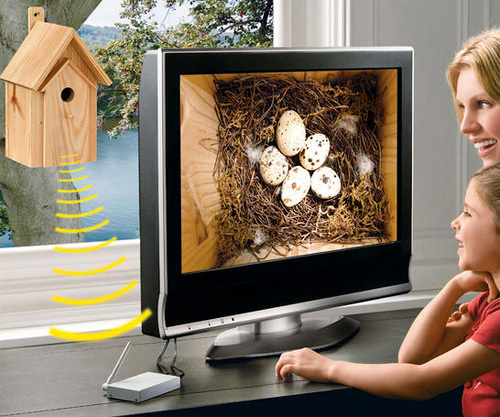 This nest box comes with an IR camera pre-installed inside that transmits a video image, night and day, to a base station that can be connected to any display with an RCA input, revealing the secrets of the circle of life. The transmitter’s got a range of about 328ft and 4 different broadcast channels in case you get interference from another device, but you’ll need to run a power feed out to wherever the nest box gets mounted since even the optional 9V battery pack is really only good for about 2 hours. You can order the kit from Pro-Idee for about $211, which isn’t cheap, but do you really want your kids learning where birds come from on the internet or on the street? I didn’t think so. Interesting idea. It seems a little difficult.